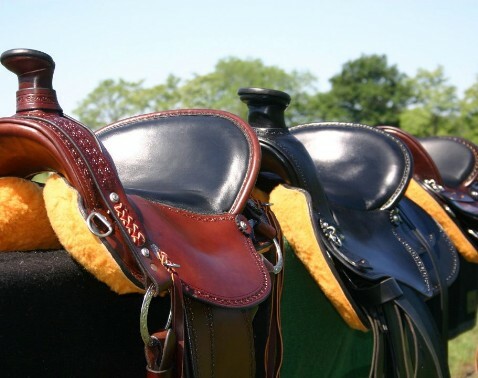 If your saddle does not fit properly it can cause a realm of unwanted behavior in your horse. If your horse hollows his back when you ride, bloats, nips or swings his head, pins his ears, does not glide into a naturally smooth gait he may be trying to tell you that his saddle is not fitting him properly. In the majority of cases most people simply want to ride and in their hurry ride simply ignore these subtle complaints. It isn't until sores, inflammations or some other physical abnormality occurs that they realize there is a problem. Imagine you and I are walking down the street side by side. As we walk, I reach over and put 2 fingers on your spine, pressing down hard right behind your shoulder blades. I ask you to continue our walk together in this manner. It would cause your back to hollow. While it may not bother you at first, but if we walked in such a manner for miles it would leave you sore at the point where the pressure was held. It would cause tense and sore muscles that would not have been normally sored (like on the mares’ neck in the story below) from trying to evade the pressure. I happened to watch a television program that was aired on the Horse Channel from a horse educationalist that wants to sell the horse public on their videotapes. The title of this show was “Adjusting Your Horses’ Attitude.” This lady brought her horse into an arena and in front of the Instructor and was asked to explain the problems she was having with this particular horse. The lady claimed she had brought the mare to the clinic because she was a chronic trail wringer but yet explained that she was an excellent horse as far as ground manners. She mounted the mare and then asked her to go forward. The faster she asked the horse to go the faster the tail wringed. I might take the time to add to this discussion that she had a western saddle on the horse. Then the educator asked the lady to come to the center of the ring and remove the saddle from the horse. At this time they started poking and prodding amongst the mare’s neck and she really did protest. They found that she was sore from about 4 inches behind the poll and throat latch back to the wither continuing on from the wither itself all the way to the point of hip. I was totally surprised that they fully blamed it on it what may have been an old injury that the horse received from being tied before this woman purchased her. That was comprehensible by me at first. But then in the very next segment that the instructor was riding the same horse in an English saddle without any tail wringing. If it had been me the first thing I would have asked you to check for the bad behavior was the saddle fit. Why did this horse behavior change from the Western saddle to the English saddle? It may have been that the Western saddle was to narrow in the gullet and inhibiting free movement or the bar angles of the tree were off offering no support in the shoulder at all thus the riders weight would rest totally on the top of the wither area. But whatever the real cause, it very well could have been that saddle. 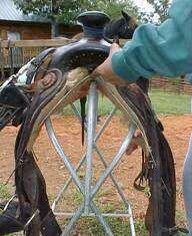 The saddle as a potential issue was never addressed. Rarely is a saddle even checked when it really should be the first thing ruled out for the cause bad behavior. If you have a horse that has good manners while you are on the ground and then it totally changes disposition under saddle, maybe it is time to check the saddle. Checking the fit properly of your current saddle takes about 15 minutes and it is so simple to do. All of the information you need to measure your horse for proper saddle fit is found on our Checking Saddle Fit page. Using the wire described in the instructions on how to measure your horse, you can easily determine if your saddle fits your horse. 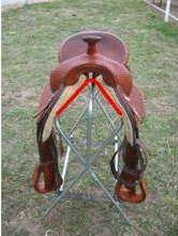 If your saddle is fitting properly, all of the wire except for the top should be touching the lining under the very front of the tree in the saddle at the very angle. See photos to the right. 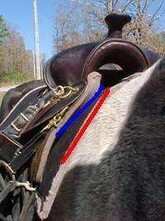 The red line in this photo represents what your wire should look like if the saddle is fitting properly over the shoulders. The wire should make contact along the surface of the bars and have plenty of clearance under the pommel. Gaps are common and depending on the severity of the gap, proper fit can still be obtained by changing rigging and/or saddle pads. If the tree is to wide, pulling away on both sides, it may be possible to still get an acceptable fit. If the tree is too narrow, it will never fit. The photo with the white triangle illustrates a great way to check to see if the tree of a saddle is the correct size for a horse. Using the same wire that you had for a tracing make a triangle out of a piece of cardboard. At the point where the wire breached the top of the wither measure straight down straight down about 3 inches and then measure straight across between the 2 points and this will give you the actual gullet measurement that you will need for your saddle. Then if you measure the bottom of the triangle that will give you the bar spread in inches. So according to the wither tracing we did on this gaited horse we would need a saddle that had a 6 inch gullet, and an 11 inch bar. The space between the top point and the bottom of the swell indicates the clearance you will have in your new saddle and ideally it should be at least ¾ to 1 inch. So now then you just take the piece of cardboard to the retailer and find a saddle with the same dimensions and you can be reasonably sure that it will fit before you buy it. Now then let's look at a photo of a saddle that is not fitting on the horse properly. If the wire is not touching the liner under the tree bars then the fit is not good. This saddle to the right with the blue and red lines is too wide at the shoulder for the horse that we did the tracing on because as you can see the wire is actually going away from the tree. If it were too narrow at the gullet then the wire would not fit up into the tree at all indicating the gullet is too narrow. A saddle that is too narrow will cause pinching at the wither on the horse. In this case the gullet is good but the wire is away from the tree ½ inch at the bar thus indication that the bar spread is too wide and this will also cause soreness in the wither area because all of the weight of the rider is actually on the wither instead of being fully distributed over the entire area.